While many agree on the importance of extending resources to support Science, Technology, Engineering and Math (STEM) curricula within K-12 education, there isn't always alignment on the best tools or techniques to, as the U.S. Department of Education explains, equip students with the "knowledge and skills to solve tough problems, gather and evaluate evidence, and make sense of information", or schools and districts with the resources and expertise to "improve the delivery, impact, and visibility of STEM efforts." 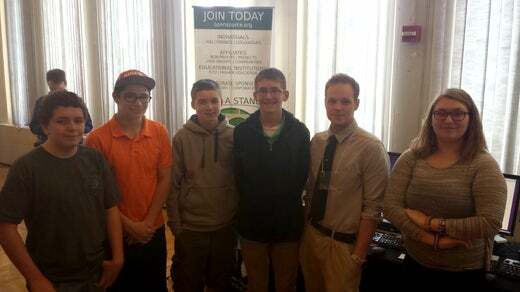 Recently the Open Source Initiative (OSI), working with the Schodack Central School District in upstate New York, developed the FLOSS Desktops For Kids Incubator Project, or as it is known at Maple Hill Middle School, the Open Source Computer Club. The program complements the technology curriculum currently offered to sixth, seventh and eighth grade students, and is designed to introduce computing and engineering concepts though hands-on, project-based learning activities. Best of all, the program is run at no additional cost to the district through the use of decommissioned hardware and open source software. The program started with then Superintendent Bob Huron, who made an innovative move to engage local entrepreneurs directly in the district's academics by creating an business incubator program, offering free office, lab and manufacturing space to startups in exchange for time teaching students the science, engineering and technology many employed in their products and services. For example, a technology startup focused on developing applications for wastewater treatment, that also creates energy out of wastewater, has been teaching a lab each semester on the life cycle of microorganisms. Initially, in order to extend the resources and the attractiveness of the incubator, the district hoped to provide computers to the startups as well, making available machines that had been decommissioned due to reaching the end of their service contracts. However, even though these machines were no longer supported by the manufacturers and were destined for the recycle bin, issues related to the Family Educational Rights and Privacy Act (FERPA), software licensing contracts, district policy and local IT support, made sharing those still-usable computers impossible. In addition, even if the computer hardware was made available to local startups, it could not include any software procured by and licensed to the district. Enter open source software. Maple Hill Middle School Technology Teacher Kristopher Navratil and Principal James Derby quickly saw the educational potential of refurbishing these decommissioned computers, and offering them to not only the startups, but students, and even the local community as well. "The program is a wonderful opportunity for students to receive some practical experience in the world of computers. There is a difference between students knowing how to use the technology we offer them, and the students knowing how the technology works," said Navratil. While STEM education does indeed enjoy a growing level of interest, so too does other educational initiatives around online learning, gaming in education, and digital literacy, all of which rely on student access to technology and computers. For many disadvantaged youth, a home computer—including all of the software required to complete their assignments—is simply not affordable. "The old computers were going to be thrown out and now the students can fix them and then get to take them home," said Derby. "It adds that extra engagement factor. It gives students a sense of ownership because it's their computer. They're working towards a productive goal." The FLOSS Desktop for Kids initiative refurbishes surplus and discarded school computers, allowing students to learn hands-on about computers and technology by diagnosing, breaking down, and repairing hardware components. Students acquire, install and configure open source software including Linux operating systems, LibreOffice, GIMP, Pidgin, etc., and not just run apps on a tablet. The program is designed to teach engineering and technology by doing, failing, fixing, frustration, and finally achieving—that's how Science, Technology, Engineering and Math really happen, and that aligns perfectly with STEM's goals: "Knowledge and skills to solve tough problems, gather and evaluate evidence, and make sense of information." The best part? Once completed, the students can take their computers home, as one student said, "for keeps." For many districts serving under-privileged students these computers not only provide educational opportunities in STEM, but extend access to support broader educational activities: logging on to their class website to download homework, communicating with classmates on assignments, researching and writing papers, all on computers they built, administer...and understand! The FLOSS Desktop for Kids program has just completed its second year, and the curriculum and format are still being refined. Currently the program is designed to run 10 weeks, with students beginning by literally pulling their computers and peripherals out of a dumpster. Next they inventory the internal components (what's there, what's missing), wipe their drives to meet district standards, and diagnose issues and repair their hardware—and in the process understand what that hardware is and how it works—until the machine boots to the BIOS. Before they can download and install their operating systems and desktop applications they first must connect to the Internet, using an Ethernet cable that they crimp themselves. 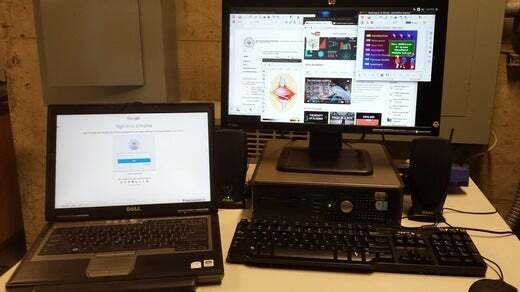 Once online, they take on the role of system administrator: setting up users and permissions, connecting to different networks, installing, configuring and customizing the software for their workstations. Each phase includes an assessment where the students share what they did to get their machines up and running, software installed, peripherals added. Collaboration is encouraged. If a student has completed their module, they can help a friend. Each machine has different issues, so the learning never stops. 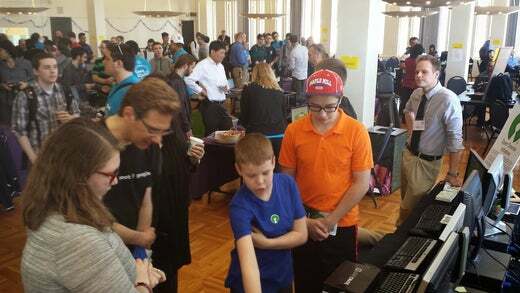 Navratil says "The Open Source Computer Club allows students to learn through problem solving, troubleshooting and identifying individual issues, yet finding solutions through collaboration." When asked about the practical vs. academic goals of the program, Navratil added, "These experiences develop the skills students need in the real world, no matter what field they may pursue. It's fantastic we can offer them a non-traditional, hands-on, collaborative environment while at the middle school level. Yes it's practical, the kids walk away with a computer, but it also provides learning opportunities beyond the nuts and bolts of hardware and software: lessons about determination, persistence, collaboration, dedication." After two years, the district and OSI are thrilled with the outcomes. Indeed, administrators are dreaming up all sorts of new opportunities: a student-centered help desk; a lab of rebuilt machines open to all students; contributions of refurbished machines to the community (senior centers, libraries, etc. ); donations of completed machines to other kids in the district. With such a positive response from the district, administrators and most importantly, the students, the OSI and Schodack CSD are ready to expand the program to other schools and districts. A curriculum and complementary resources are under development to provide interested teachers and schools with the academic and organizational resources to implement the program: teaching and learning activities, infrastructure requirements, how to work with district administrators, etc. If you're interested in learning more about the program, or maybe you're already doing something similar, please visit the FLOSS Desktop for Kids Incubator Project at the OSI. Wow! What a great program. As a former tech director I always thought it was a waste to send our old machines to the recycler. What does the district do? Do they "shred" the old hard drives and put new ones in these old machines and then refurbish them? I'd like to know more. Thanks for your enthusiasm. The students wipe the drives using DBAN (http://www.dban.org/), which also provides a nice lesson on how data is stored and retrieved. This also alleviates some of the burden on the IT department when decommissioning machines--a "win win" for the program and district. We (the OSI) are now expanding the the program to other schools / districts that are interested and have developed a curriculum and resources for teachers to help implement the program. Happy to share, feel free to contact me directly. Patrick, the wiki won't allow me without credentials. We did use Dban or something like it at my former school system. I used to use older laptops to introduce some students to Linux and open source software and often thought of the e-waste we could save by recycling those machines in the community.